The technology that produces hydrogen using renewable electricity has already passed crucial regulatory tests for grid balancing in a commercial environment, despite what I said here a month ago. For over 30 years the prophets of green energy have been promoting the idea that the “hydrogen age” is just around the corner. The gas is abundant in the form of water, molecules of which possess two hydrogen atoms for every oxygen atom. The problem has always been the right price, which provides the market incentive for investment in the necessary infrastructure. A month ago I wrote a piece on a proposal to convert the UK’s gas grid to hydrogen. The reports I covered judged that the most likely route to creating the hydrogen was through the steam reforming of methane. This is not a climate friendly way of doing it, although it is currently by far the most common. In a low carbon future, producing hydrogen this way in the required quantities would be unlikely without the ability to capture the carbon released by this process and store it underground, a relatively unproven and expensive process dubbed Carbon Capture and Storage. I had compared in my article the cost of steam reforming with CCS with the cost of producing hydrogen by the electrolysis of water using wind or solar power. My source for the latter information was an apparently reliable one: the Energy Institute of University College London, which produced a report in April last year authored by Samuel L Weeks about using hydrogen as a fuel source in internal combustion engines. This states: “Hydrogen produced by electrolysis of water is extremely expensive, around US$1500/kWh [AU$1959/kWh]. The editor of The Ecologist magazine, Oliver Tickell, pulled me up on this, observing that it struck him as being way too expensive. I tried to get Professor Weeks and the UCL Energy Institute to give me the source for the $1500 figure but so far have not had a response. So instead I turned to a company that is already making hydrogen from renewable electricity for grid balancing and fuel cell powered cars: ITM Power. They provided me with another professor, Marcus Newborough, who is their development director. He gave me a much lower figure. Indeed it does. It is 4545 times larger, if we are comparing like with like. And I apologise for not checking more thoroughly. And I’m still mighty curious as to why UCL Energy Institute got it so wrong. The process is called power-to-gas (P2G) and it is useful when too much renewable electricity is being produced compared to the demand that exists at that moment. Instead of it going to waste it could be used to produce hydrogen as a form of energy storage and used when required. Overall efficiency is said to be over 70 per cent and the plant is now participating in Germany’s secondary control (grid balancing) market. Work is ongoing to see how the plant can be integrated into an increasingly intelligent future energy system. “For the duration of the demonstration, we want to integrate the plant so that it actively contributes to compensating for the differences between renewable energy generation and power consumption,” Thüga chief executive Michael Riechel said. In the UK, the national grid is introducing an Enhanced Frequency Response service to pay energy storage technology operators to provide sub-second response. “ITM has already pre-qualified to provide such a service,” he said. They are also introducing a Demand Turn Up service, which will pay operators £60/MWh (AU$102/MWh) for operating overnight and on summer afternoons to absorb excess wind and solar power. “Clearly the economics of P2G are a function of such balancing services payments from the grid operator and the electricity tariff,” he said, “but in addition P2G offers a greening agent to the gas grid operator in the form of injecting hydrogen at low concentrations into natural gas. “So the economics are also a function of the value placed on greening up the gas grid. By analogy we have seen in recent years in France, Germany and the UK, feed-in tariffs for injecting bio-methane into the gas grid as a greening agent and these have been up to four times the value of a kWh of natural gas. It was at this point in our conversation that he gave me the price at which the company is currently selling high purity hydrogen at its fuel cell car refuelling stations. Reusing this stored energy in the gas grid, for transport or in industry, it said, would provide a valuable contribution to decarbonising these sectors. The European potential, in 2050, of this value would be “in the hundreds of gigawatts”. The Kinsey report contrasts the use of hydrogen with the use of batteries, which it calls power-to-power or P2P because it’s electricity rather than gas that comes out. 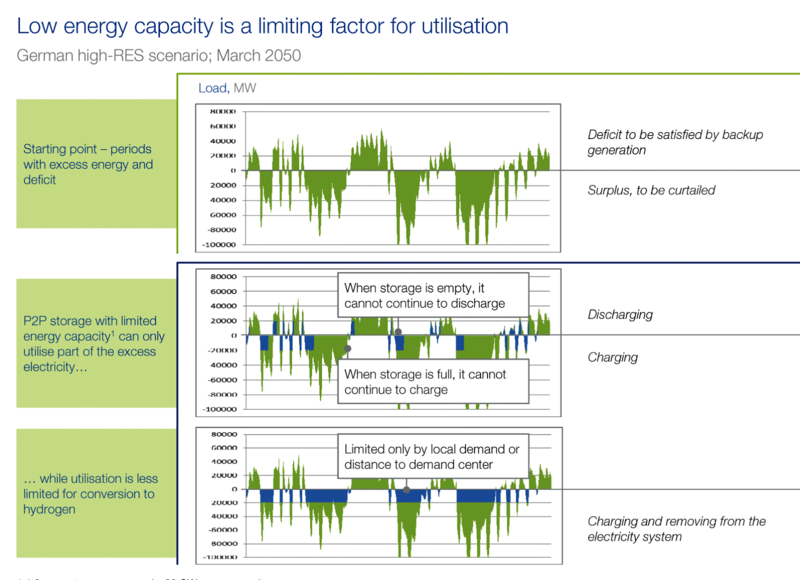 How low energy storage capacity is a limiting factor for the use of batteries. Nevertheless the Kinsey report warns that current regulations lag behind the potential of these technologies. Reviewing them is the key to unlocking this enormous opportunity. With the UK Met office this week saying that we have already reached 1.38°C temperature rise since the beginning of the industrial revolution and the Paris Agreement aspiring to keeping that rise to 1.5°C, the task of mainstreaming these technologies becomes even more urgent. This article is republished from The Fifth Estate. Originally published on 9 August. David, with the German renewables sector under intense pressure to make money after subsidy cuts, the only purpose of absurd efficiency numbers being posted for electrolysis is marketing. None are peer-reviewed; all are from German companies with skin in the game. Or maybe you missed that the McKinsey report you cite was not “undertaken” by them in a philanthropic gesture of goodwill, but bought by 32 global players in energy including TEC sponsors Shell and Siemens. Advertising. Germany, give it up. Die Energiewende ist kaput. David, the problem with really using intermittent renewables for hydrogen production is that you can only produce hydrogen intermittently. Yes, you might aquire cheap stranded power, but your utilization of the electrolysis equipment will be very bad, which greatly increases its capital investment per useful kWh. The hydrogen prices quoted are probably heavily subsidised. It would be interesting if you could find the capital costs for any such plant, along with its annual hydrogen production. Then we could do some interesting calculations regarding the viability of P2G. It never ceases to amaze me how much trouble people have with the difference between power and energy — kW vs. kWh. $1500 sounds about right as the capital cost of 1 kW of electrolysis capacity. I.e., a cell that draws 1 kW of power to produce streams of hydrogen and oxygen gas. That’s entirely different than the cost for a given quantity of hydrogen, though of course it figures in to the latter through the cost of capital. Sure, hydrogen can be made from electrolysis, but the cost is rigidly defined by the 34 kWh of energy in each gallon-of-gasoline-equivalent (gge) of fuel. So with a plausible 70% conversion efficiency, a 4¢/kWh electricity cost contributes $2/gge of energy cost to the resulting fuel, plus levelized capital cost (which gets worse at low capacity factor); this relationship will not be changed by future breakthroughs. What this means is that fuel synthesis can only be economical when off-peak electricity can be obtained for nearly zero cost. In fact, David’s source is hoping for a negative cost, based on the grid regulation service that the dispatchable load can provide (yet another reminder that use of high penetration renewables leads to cost beyond just the levelized electricity cost). This means that the total amount of electricity going into the synfuel industry will always be much smaller than the amount of electricity that society consumes directly. The amount of hydrogen or other synfuel which can be made is therefore small. Thus the possibility of a power-to-fuel does not change the conclusion that to build a low fossil fuel energy system, most end-use applications of fossil fuel will have to switch to electricity or heat. Electrification gets plenty of press, so it is really residential, commercial, and industrial heat networks that we need to be talking about. Heat is inherently much cheaper than electricity, and is more storable too. For urban and suburban users in cold climates, district heat networks using hot water as a carrier are an excellent clean replacement for fossil fuel heat. Industrial applications can use steam as a heat carrier in smaller networks, or on-site nuclear plants. The UK in particular, is lagging its European neighbors, but is getting on slowly. Nathan, “heat is inherently much cheaper than electricity, and is more storable too” carries a host of assumptions with it, not the least of which is that heat can be generated locally to where it’s needed at no cost in efficiencies of scale. Electricity’s “transmittability” makes it uniquely suited to capitalize on efficiencies of scale unavailable to heat. If Southern California’s power outages come to pass as expected, I expect a run on natural gas electricity generators. And if gas prices remain low enough, what’s to keep owners from generating their own electricity at lower cost – and a fraction of the efficiency – of utility generation? From an environmental standpoint that’s a disaster in the making, and one from which there’s little chance of turning back. Isn’t the idea to overbuild renewables and then use P2G as storage instead of batteries, pumped hydro or the like? The problem then is that we have 70% efficiency in electrolysis, then 45% efficiency in electricity production from the hydrogen-methane mix, so 30% roundtrip. With 70% losses and high capital costs, I wouldn’t bother. CCUS technology breakthrough may come from development of cells that use CO2 as a fuel to produce energy and non-greenhouse gas byproducts. This research from Korea and Georgia, a Na-CO2 cell produces electricity and hydrogen from CO2. Some weeks ago, I posted a link to news about a train powered by hydrogen in Germany. Now the element is being tested for use in powering apartment complexes and smart cities in Netherlands. To provide context, blue hydrogen is produced using..
Good to see progress in hydrogen market.Air Liquide expects to invest over 150 million US dollars to build a liquid hydrogen plant in the western United States, with construction to begin in early 2019. The plant will have a capacity of nearly.. The International Energy Agency tells us to be on the lookout next year for a major report on the potential of hydrogen. How valuable do you feel that meetings like this Energy Business Council session are to advance dialogue and planning among..